The unlikely combination of Telly Savalas, Franco Nero and Mark Oliver! 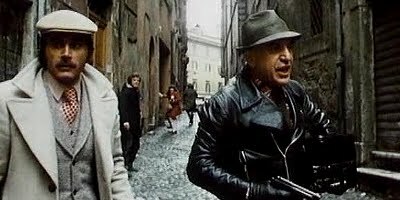 Lester is the driving force of this rather odd crime caper from Georgy Girl and Loot director Silvio Narizzano. After a bungled jewel heist, sociopath and all round loose cannon ‘Memphis’ and partner in crime ‘Mosquito’ take a British diplomat’s son hostage as they go on the run. The nationwide police manhunt for the trio is made easier by the trail of corpses Memphis leaves in his wake as they make for the French border – including that of Mosquito’s girlfriend and getaway driver Maria, Ely Galleani, in a disturbingly casual scene. ‘Nice’ hood Mosquito, Nero, gradually becomes a surrogate father figure to the boy as they trek across the Italian countryside, first just escaping from the law but ultimately from the psychotic Memphis himself. A gonzoid, seemingly cocaine-fuelled performance from Savalas takes a lot of getting used to, as do Lester’s clipped English tones whining ‘Mosquitooooe’ every two minutes. However, some scenes between Lester and Nero do succeed in being quite touching and the ending, although predictable, manages to be moving nonetheless.